Firstly, I would like to express my humility for the generous love and appreciation I receive from people around the world. On a daily basis, I receive your numerous questions and requests for advice on personal development, achieving your aspirations or addressing challenges you face on many issues. You invite me to events and to join your organizations and I know I can’t meet all your requests due to my tight schedule, I instead try to produce short inspirational videos, articles and quotes that can be shared, but that may not be sufficient. Many young people around the world want to meet up with me too. I thank you all for your confidence and trust in me. This has made me realize that I have so much to give to people, since my emergence as the Global President of the Commonwealth Youth Council, I assumed incredible responsibility of providing leadership and direction and inspiring young people. This did not stop after my tenure; in fact, the expectations keep increasing day by day. I have realized I need to do more to live up to the leadership role and expectations in shaping the minds and futures of our young generation. I am grateful for the opportunities and responsibilities you bestowed on me, my huge and wide experiences have taught me a lot and I am ready to give back to make other people’s futures even more prosperous. I am willing to listen to you, learn from you and inspire you more. I know I cannot satisfy your demands individually and perhaps not make the desired impact at informal settings. Therefore, I have spent the last 10 months developing a comprehensive Leadership and Personal Development Programme that will serve as an official or formal platform that will enable our frequent engagement, effective learning, mentoring sessions, effective training and personal development that will make a sustained and positive impact in your lives. The programme responds to your desire for close mentorship and personal development. It also responds to the need to realize your strengths and weaknesses and to fill the gaps. It contains 39 modules strategically selected to fill development gaps, and there are capable professionals on board who will help me in delivering the modules. I will run this course for the first time in Katsina, it is open for participation for all interested participants from any part of the country. The programme will be rotated across the states, the African continent and beyond. The programme will be reviewed based on the target audience and location. 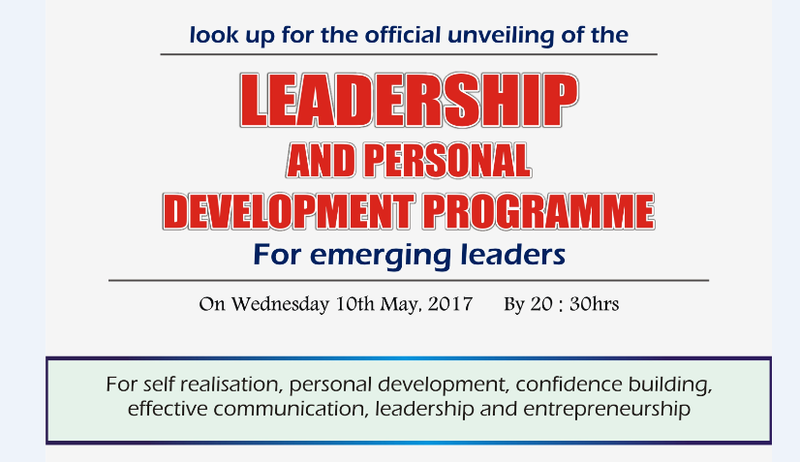 I will officially announce the programme on Wednesday, 10th May 2017, when I will share in detail the objectives, purpose, structure, and the registration form of the programme. Watch this space! !